We don't have any beaches here in T-ville so we have to drive a couple of hours in any direction to get to one. There are a few that are well worth the drive, and of course for a weekend getaway we do have plenty of choices. areas have now been restored but the damage was unbelievable. Thanks for stopping by... now check out some other Corner Views..... and thanks to Jane at Spain Daily for her brilliant pictures!!! I can hear the sandsqueaking here, all the way up in The netherlands. 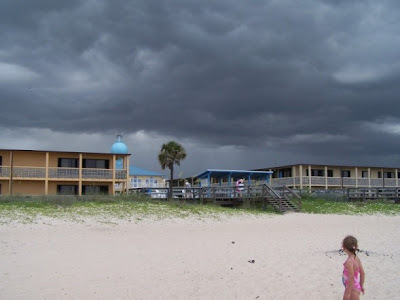 I'm glad you showed some pretty Florida beaches, since I chose to show a not very pretty one. cool shots! i'll take any beach in florida, but the alabama coast totally surprised me the first time i saw it. it has some of the prettiest sand i've EVER seen - powdery and white - just beautiful! Oh. . the shells. I hope to find at least one beach this summer where we can collect shells. I was amazed the first time I heard the sand squeak.. I wasn't sure how that was going to be but it's really neat. 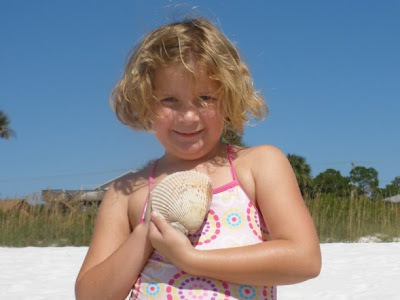 Shell collecting is big business in my house, and there are all sorts of things come with it.. crabs legs, sand dollars, rocks..
Jane. yes I agree it is nice and cosy. I will endeavour to add everyone to my side bar in the hope of making it easier to view all these glorious posts... i can't get enough of it!!! Thanks for the inspiration!!! besos. Ali. So many different views of beaches around the world... We never get hurricanes here. Thay look like buildings built to be destroyed - houses of cards - which I guess is all buildings on a beach should ever be. 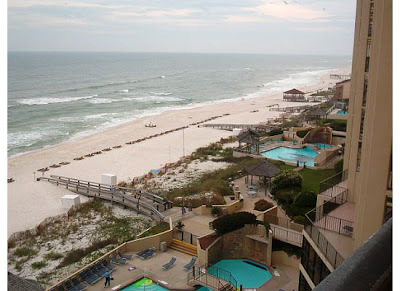 It's quite interesting to me how there can be swimming pools so close to the beach. Love that big shell! I have never heard of sand squeaking.. now I am curious! Very cool pictures! Francesca... that's for people like hubby who won't swim in anything unless it's chlorinated!! Crazy American's everything is so convenient!!! ian...once again it's a throw away convenient society, if the hurricanes blow it away no biggie they'll just build it again. Caitlin.. you're welcome to come and test it out, it's really an awesome sensation!! the storms ARE beautiful when they're not completely destroying everything. very cool pictures. love your daughter with her shell. so cute! squeaking sand - love it. that is one big shell !! !